I tried to jump as quickly as I could on the NSD bandwagon in 2004 when the first pictures of the Dalek were leaked, however my model was pretty poor as you'll see below. Many revisions later and it's a littler. Far from perfect but it does a job. Here's quick run-down of it's development and uses in the media. 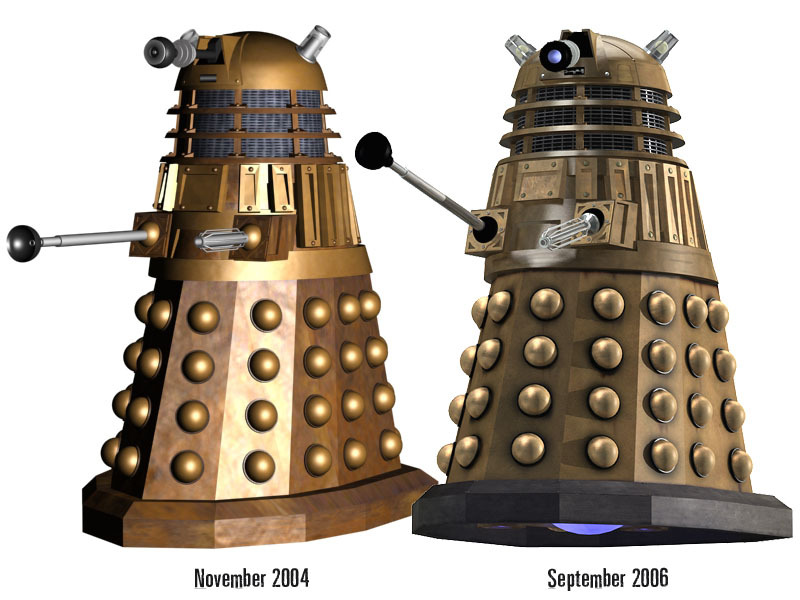 In mid-2006 I needed a more accurate Dalek, so my original mesh which I'd started back in 2004 needed a massive overhaul. 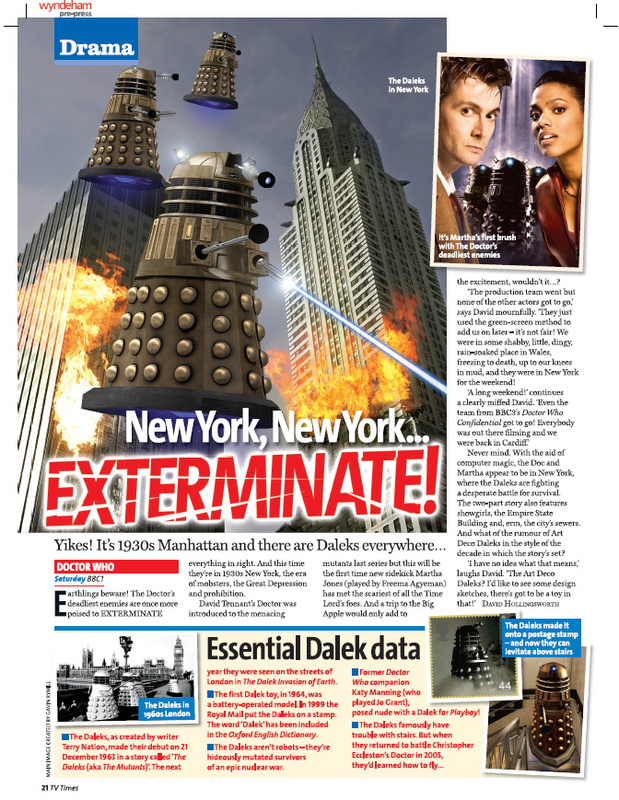 Virtually everything about the Dalek was in need of improvement. Everything from the width of the neck widgets, to the inaccurate shoulder slats needed correcting, plus my biggest annoyance (which I nearly didn't change because I didn't know how noticable it would be) was that the bases for my skirt domes were a solid cylinder, like a thick coaster, but they needed to have a lip like an upturned jamjar lid. I also worked very hard on the textures as you'll see on my 2005 second version they were super-shiny as if they'd just come off the production line. I worked hard in 2006 to make my Dalek look dirty and stained like the TV prop, and I tried hard to get the reflectivity as close as possibly, which is no easy task. High levels of reflectivity always make rendered 3D objects look more realistic so its always a temptation to go overboard with the mirror effect. I still remain unhappy with elements of this model and the dimensions aren't quite perfect. One day, maybe I will start again. 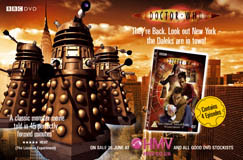 I'm still proud that it ended up in various uses, such as an HMV poster and in the TV Times. 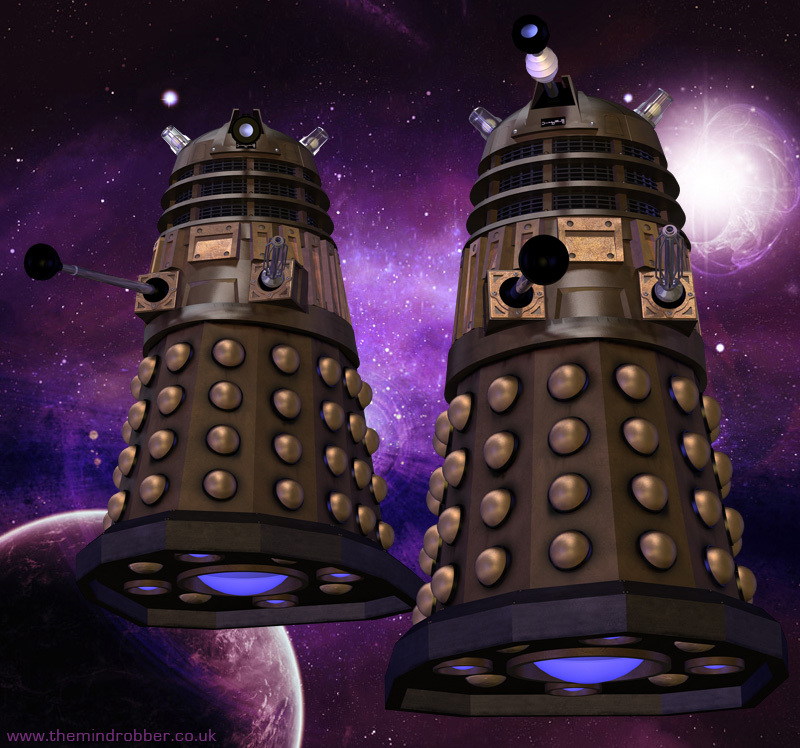 When images were leaked in November 2004 of the new Daleks from the new series of Doctor Who I soon decided it would be a good idea to build a 3D model. It took 15 hours of modelling time and it was the first Dalek shape I attempted but it was finished 27th November. Following the broadcast of the final episode of Doctor Who, The Parting of the Ways, I finally got round to correcting lots of the innaccuracies in my original model. Almost everything about it was wrong, or lacking in detail. Since July 2005 I have switched to rendering in Cinema 4D due to its HDRI and radiosity which produce very nice renders. 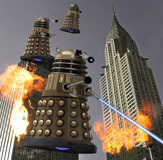 This new Dalek first appears in the episode called "Dalek" written by Robert Shearman, and subsequently re-appeared in the episodes "Bad Wolf" and "The Parting of the Ways". It represents a a bulkier, more heavy-duty style of Dalek. Despite the updated and quite different appearance of the Dalek in episode 6 of the new series, it represents the old breed of Daleks which we are already familiar with, and the Doctor clearly recognises his foe and makes no comment on its appearance. 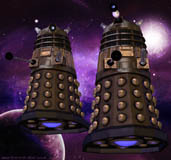 This is the style of Dalek which is represented in my 3DS MAX mesh. Episode 6 was originally to have been called "The Museum Piece" and then "The Creature Within" but its eventual title was the far more straight-forward "Dalek". 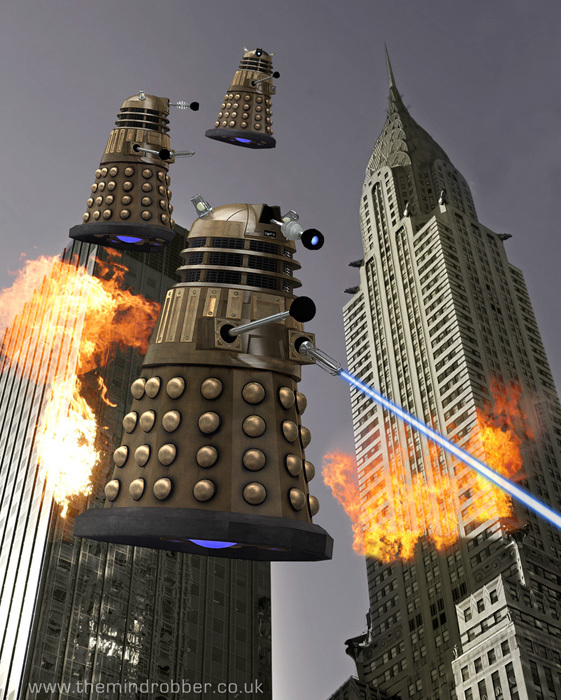 Rumours that the season finale would boast totally redesigned version of the Daleks turned out thankfully not to be true. The new Daleks from the new series of Doctor Who at first glance most resemble the Peter Cushing Daleks of the 1960s movies. The reasons for this are firstly the new Daleks have the large bases that were only ever seen in the TV series once (The Dalek Invasion of Earth) and secondly the very large lights (only ever seen on TV on the supreme Dalek in Planet of the Daleks which was a borrowed stage prop). New to the design are the cyclindrical bases which each of the domes is set upon. There is intricate detail around the gun and arm joint with beveled triangle and diamond patterns and also a cut shape between the limbs. The mid-section of the new Dalek has chunky blocks which are bolted on and an inclined channel down the centre of each block which gets deeper towards the top. The neck section's vertical divides are thicker and the intersections with each neck ring have bolt fixtures. Finally the eye-piece of the new Dalek has a rectiliniar housing to hide the point where the eye pivots on the head. This housing has a channel cut in the top to allow the eye stalk complete vertical freedom. Beyond these surface details these new Daleks are very true to their original form, however the whole body is wider than previous Daleks. When I built this 3D model I used the dimensions of an original 60s Dalek and the finished renders on comparison to the leaked production photos show that my model isn't broad enough. But for now this is verion 1.0 of the new series Dalek and when there are more photos to work from I will begin a more accurate model.